Tropical Depression Carlotta continues to hug the coast of southwestern Mexico and drop heavy rainfall. NASA's Aqua satellite provided a look at cloud top temperatures through infrared imagery to find out where the most powerful parts of Tropical Depression Carlotta were located. 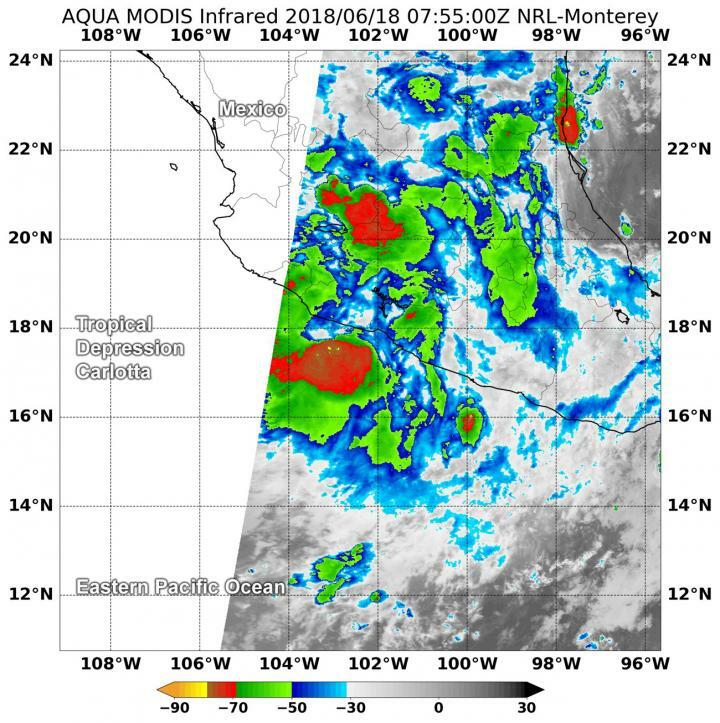 NASA's Aqua satellite found very cold cloud top temperatures and strong storms in fragmented thunderstorms over mainland Mexico and the Eastern Pacific Ocean. On June 18 at 3:55 a.m. EDT (0755 UTC) the MODIS or Moderate Resolution Imaging Spectroradiometer instrument aboard NASA's Aqua satellite revealed some cloud top temperatures in a fragmented band of thunderstorms were as cold or colder than minus 70 degrees Fahrenheit (minus 56.6 degrees Celsius). NASA research indicates very cold cloud tops with the potential to generate very heavy rainfall. That heavy rainfall is reflected in the forecast from the National Hurricane Center who noted "Carlotta is forecast to produce 3 to 6 inches of rainfall along the Guerrero, Michoacan, and Colima coasts, with isolated higher amounts of 10 inches possible. These rains are likely to produce life-threatening flash floods and mudslides, especially in areas of higher terrain. Elsewhere across the states of Guerrero and Michoacan, rainfall amounts of 1 to 2 inches with isolated amounts of 4 inches are forecast." At 11 a.m. EDT on June 18, the National Hurricane Center (NHC) in Miami, Florida noted that "locating Carlotta's center this morning in conventional satellite imagery has been difficult. An earlier 4:06 a.m. EDT (0806 UTC) GMI polar orbital microwave pass, however, was helpful in confirming that the system has in fact persisted as a small, relatively symmetric tropical cyclone." At that time, the center was found near latitude 17.9 degrees North and longitude 103.1 degrees west. That's about 60 miles (95 km) west of Lazaro Cardenas, Mexico. The depression is moving toward the northwest near 5 mph (7 kph) and this general motion is expected to continue through tonight, June 18. Maximum sustained winds are near 30 mph (45 kph) with higher gusts. In addition, southwesterly swells are affecting the coast of southern and southwestern Mexico. These swells are likely to cause life-threatening surf and rip current conditions. On the forecast track, the remnants of Carlotta should be near the coast tonight and early Tuesday. Weakening is forecast, and Carlotta is expected to become a remnant low by tonight, and dissipate by Tuesday morning, June 19.